Many higher education institutions pride themselves on their ability to prepare students for the workforce. Experience is often the best teacher and learners can gain experience through internships. Most schools define internships, research opportunities, fellowships, and externships as experiential learning. Each experience is unique and offers different student benefits. Internships allow students to gain experience at an organization. Placements usually last one quarter or semester and students can receive academic credit. Fellowships pay students to participate in research projects. Most schools reserve grants for learners at the graduate or postgraduate levels. Fellowships last for a year and can be renewed depending on stipulations. Similarly, students interested in research can work on projects with faculty members. Many schools coordinate these experiences and let researchers publish and present their findings. In externships, students shadow a professional for a few days. The colleges below offer most of these placements and provide additional support to help students find off-site experiences. Institutions with an emphasis on internship placement and career coaching prepare students for the job market. Located in the thriving metropolis of Philadelphia, Pennsylvania, Drexel university educates future leaders and professionals from all over the world. The university takes a unique approach to internships by managing a cooperative education program for students. The university's Steinbright Career Development Center manages all co-op placements. The center works with national and international employers in more than 30 states and 51 countries. During a student's freshman year, the center provides career counseling and internship advice. While enrolled at Drexel, students can visit the center for workshops, resume reviews, and job support. Learners can select a four or five year co-op program depending on their major. In a four year program, students take on one co-op experience. Students in a five year program have three different co-op placements. This experience allows students to alternate between full-time enrollment and full-time employment while obtaining their degree. According to the school, over 90% of undergraduate students participate in the co-op program. With a 93% graduation rate, Cornell University prides itself on cultivating talent. Part of the cultivation process includes internships. The school hosts a student internship panel where current and former students discuss the unique opportunities they were afforded through the university. The school's career development center works with students to improve interviewing, resume writing, and job searching skills. The school also works with the Career Education Institute's (CEI) online database to offer students access to internship opportunities throughout the U.S. and abroad. The Cornell Cooperative Extension Summer Internship Program connects students from the college of agriculture and life sciences and the college of human ecology to local communities. Through this program, students work in different positions to help with agricultural and natural resource issues. Another database, PreserveNET, created in 1994 by Cornell alumni, helps students interested in preservationist jobs and internships find placements. Centered in the bustling city of Atlanta, Georgia, Georgia Tech assists students with career advancement through the Center for Career Discovery and Development (C2D2). The center prepares students for career fairs by offering tips and techniques for speaking to recruiters. The university's career fair is one of the largest in the area, with over 400 companies in attendance. The center also advises international students in the job search process. C2D2 keeps students up-to-date with application deadlines for coveted internships and fellowships. The center's experiential learning program specializes in co-ops, internships, and global internships for learners. Students in the co-op program receive an advisor to manage their paperwork and schedule. Learners enrolled in the GT Internship program take a part-time or full-time 16-week internship during the fall and spring semester or a 12-week internship in the summer. The program allows students to intern for more than one semester and work at multiple internships. Full-time placements require 35 hours per week, part-time placements are 20 hours per week. Revered for its commitment to education and innovation, the Massachusetts Institute of Technology welcomes students interested in the sciences. The Office of Experiential Learning encourages hands-on learning through five programs. The school also manages programs for interns. For student interns, MIT offers the Undergraduate Practice Opportunities Program (UPOP), MISTI, MIT Washington, the D.C. summer internship program, MIT Public Service Center, and externships. In the UPOP program, sophomores receive college credit for internships and career development training. MISTI coordinates placements for students at companies and labs all over the world. The Washington, D.C. initiative lets students travel to D.C. to learn more about science, technology, and public policy. The Public Service Center emphasizes fellowships and internship in government and the alumni association handles externships that pair students with a mentor. Northeastern University encourages student development with co-op, service learning, and global experiences. The university has a co-op process that integrates cooperative education into curriculum. Learners choose between four-year and five-year programs. The four-year program requires two co-ops and the five-year program consists of three co-ops. The global experience allows students to go abroad and study while researching and working in a foreign country. Learners also have the option to participate in a research experience. The National Science Foundation sponsors opportunities for students majoring in a science-related field, such as physics, chemistry or biology. The school also provides housing for summer interns. For communications majors, internships equate 140 hours of service to four academic credits. Students must meet with an internship coordinator to review their journal documenting the experience. They also write two papers about their experience that are evaluated by the internship's supervisor. Students enrolled in the health equity program work four hours a week for one semester at the Institute on Urban Health Research. Known as Indiana's land-grant university, Purdue University takes the internship and job process seriously. The school encourages students to use the Career Decision Making Model to map out interests and skills related to career goals. Students enrolled in the electrical and computer engineering college can intern at Parsec Solutions and Microsoft through the school's partnerships. Study abroad students have the opportunity to intern in countries like China and Australia. Learners seeking local and international internship placements can find opportunities on the university's online job and internship board. The Discovery Park Undergraduate Research Internship accepts undergraduates interested in researching sustainability, global security, and health. The Office of Professional Practice oversees intensive internships. These internships enable students to intern for more than one semester or rotate through different departments within a company. The Global Engineering Alliance for Research and Education combines foreign language study with a 10-12 week international work experience. As one of Virginia's premier public universities, the University of Richmond gives students access to internships at top companies. The Spider Expo, held at the school's Queally Center, introduces students to major employers like SunTrust Bank and Geico. SpiderConnect, the school's online job search engine, lists job and internship opportunities for undergraduate and graduate learners. Students who want to intern in another country can do so through a summer fellowship. The school funds internships through the Spider internship. The school's internships cater to every demographic. Chaplaincy summer internships give students the opportunity to intern at faith-based or nonprofit organizations. The CCE Urban Education Fellows Program places students in Richmond organizations dedicated to helping and educating the youth. Likewise, the Arts and Sciences Summer Research Fellowship supports students working on research projects. Applicants must have a faculty mentor and work 40 hours a week for 6-10 weeks on the project. The University of Pennsylvania fosters student growth and development by encouraging students to apply for internships and fellowships. Penn State curates its own internships in the humanities, public service, media, and abroad. Opportunities like the Penn Social Entrepreneurship Mentoring Program connect students to entrepreneurs within the university's network. Likewise, the Civic House Community Engagement gives funding to students entering year-long internships with community service organizations. The Fox Leadership fellowship awards $3,000 to a student completing a 10-week assignment in Philadelphia or Harrisburg, Pennsylvania, during the summer. The Center for Undergraduate Research and Fellowships facilitates research opportunities for learners through initiatives like the Undergraduate Climate Action Grants for Sustainability Research. The Research Mentorship Program presents first and second year students with a $4,000 stipend for assisting a faculty member with a research project. The university's Center for the Advanced Study of India organizes summer internships in India for affordable healthcare and labor and rural urban migration, among other causes. The College of William and Mary offers students internships and externships to prepare them for the professional world. 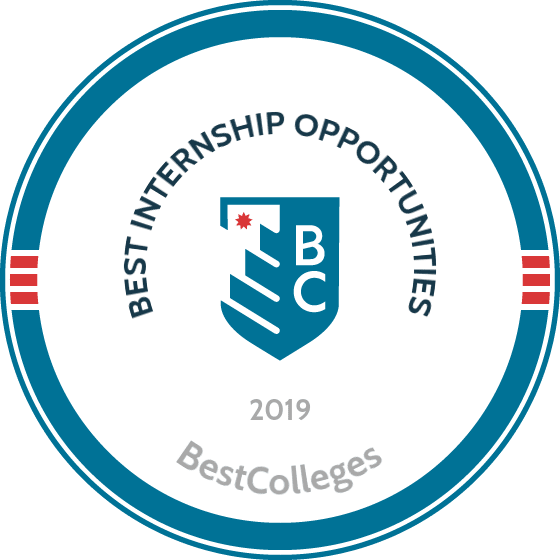 Students can apply for internships through the Cohen Career Center which coordinates placements for students during fall and spring semesters. Students intern at companies in the greater Williamsburg area for up to 10 hours per week. Tribe Careers, the school's personal job board, also lists internships for students. The school partners with other internship programs, such as INROADS Business and Industry internships and HACU National Internship Program, to help minority students find positions. Students looking for a different type of internship experience should consider an externship. In the school's Pilot Program, students shadow a professional for a day. Students that want an externship can attend the school's externship seminar in the fall to learn about openings. The Cohen Career Center also covers unpaid intern expenses through the Funding for Unpaid Summer Experiences program. Wake Forest University makes it easy for students to earn academic credits for internships. To start the application process, students review the internship course for their major. Departments employ an internship coordinator that handles student experiences. If a department doesn't have a coordinator, a professor can step in and monitor an internship. Students can register for the business 181 class, a one-credit elective that gives students the tools to reflect and write about their internship. The Office of Personal and Career Development manages the university's placements. For business majors, the business and enterprise management internship program requires learners to work 200 hours at a placement and write a report about the experience. Students pursuing the arts can apply for the START Gallery or Secrest Artists Series. In the START Gallery experience, interns perform clerical duties and organize events while learning about art gallery management. Nestled in the midwestern town of Notre Dame, Indiana, the University of Notre Dame follows a strict policy for internship credits. Applicants must receive approval from their department to receive one to three credits for an internship. Once approved, credits are applied to the student's major. Notre Dame boasts an extensive list of internship experiences. The Career Development Funding program financially supports students while they complete summer internships. Unpaid interns receive up to $3,500 and paid interns receive $1,000 stipends. With Kellogg Summer Entrepreneurship Internships, Notre Dame undergraduate students can travel to Asia, Africa, and Latin America to work on research projects. For these study abroad internships, the school offers two other programs, Experience the World (ETW) Fellowship and the Kellogg/Kroc Undergraduate Research grant. The ETW fellowship caters to freshmen and sophomore students. Juniors and seniors apply for the Kellogg/Kroc grant. Located in Dayton, Ohio, the University of Dayton strives to match students with the right internships. Students can meet with career advisors to discuss job search strategies. Career services let students register their internship as an experiential course and receive academic credit if the placement is 10 weeks. When students register an experiential learning experience, it becomes part of their transcript. The internship coordinator handles credit approval. The school uses an early work term form to track students participation in co-ops or experiential programs. The school requires learners to register co-ops as a course during the summer, spring, and fall semesters. Additionally, the career services center invites companies to campus to interview students throughout the year. Students that meet certain requirements can register for pre-selected and open interviews. The center encourages students to use FOCUS 2, an online career and education planning tool. Similarly, the alumni mentoring program connects students to former graduates. Missouri University of Science and Technology (Missouri S&T) boasts impressive internship numbers. Between 2015-2016, the school placed students in nearly 1,000 co-ops and internships where they earned $3,000 to $4,000. The Office of Technology Transfer and Economic Development funds a program for students in experiential learning placements. The Entrepreneurial Internship and Cooperative Education Program grants up to $10,000 to Missouri S&T students. The department supports three different learning options. The venture option places students in a startup business venture, while the project option engages learners in an early-stage business. Lastly, the ideation option allows students to develop an idea for a business and devise a plan to bring it to fruition. To qualify, placements must be four months long and students should work full time. Students involved in other internships can register for credit or transcript addition through the career center's website. Smith College has an online guide for students seeking internship opportunities. The guide emphasizes internship benefits. It also mentions other databases and websites students can visit to find placements. The Lazarus Center for Career Development assists with the college's fellowship program. For Smith students to take on a fellowship, they must first register through the school. Smith has two fellowship advisers to help students find fellowships, complete applications, and offer guidance. Smith also sponsors applications for major fellowships while maintaining their own programs such as the Humanity in Action Summer Fellowship and the Smith International Experience grant. Smith attendees studying the arts can apply for the Susan Rose Internship in Music. Winners receive $5,000 to pursue performance, music administration and other music-related internships. Smith's School for Social Work coordinates employment-based field internships. Students currently working at a site can apply to receive internship credit for their work. George Mason University (GMU) prepares students for post-graduate life, through designed career courses that help students select a major, attend graduate school, and develop professional skills. The internship/career readiness course teaches students to write a resume and choose an internship based on career goals. To assist students with a job and internship search, the school uses the handshake database which links employers to GMU attendees and graduates. GMU promotes networking through career panels, fairs, and resume clinics. The career center gives students access to InterviewStream, a place where students can improve their interviewing skills. The on-campus interviewing initiative connects students to local employers. Once an employer selects a candidate for an interview, applicants use the Handshake database to schedule an on-campus meeting. With a $1.6 billion research budget, Stanford is one of the best research universities in the nation. The university strives to give everyone a quality education by offering free tuition to families that make less than $125,000 per year. Students in the Bing Overseas Studies program can apply for internships while studying abroad. While living in foreign countries, interns can use placements to gain academic credits or work experience. The Undergraduate Advising and Research (UAR) department awards grants to learners studying abroad. Every undergraduate student receives a UAR advisor to help them with research projects and general support. For students majoring in international studies, the Global Opportunities and Enrichment for Students program secures placements at international policy and affairs organizations. Learners concerned with the environment can refer to the TomKat Center for Sustainable energy. The center supervises two internship experiences, energyStartup summer internships and TomKat Energy Impact summer fellowships. With a 96.3% undergraduate placement rate, Villanova helps students find and secure internships. To receive academic credit approval, students must follow certain guidelines. The university requires applicants to submit the student internship agreement to begin the process. Then, students and their employers must complete evaluation reports. Students must also keep an activity journal and write a paper to recap the experience. Students that log 150 hours at an internship earn three academic credits. The athletic department offers paid and unpaid internships to qualified students. Most of these internships last for 10 months. The O'Donnell Center for Professional Development manages the spring accounting internship. Villanova juniors can earn up to 12 credits for completing a full-time internship during the summer. The Clay Center and the O'Donnell Center join forces to host the "Rise to the Top: Experiential Education" series to train and prepare learners for the internship search. Since 1821, Amherst College has committed itself to improving the lives of students through education. The college awards funding to students in unpaid and low-paying internships and research opportunities. One program grants $3,500 to interns living at home and $4,500 to interns living independently. Applicants must attend a pre-departure workshop and submit their applications by one of the three spring deadlines. Students that want to go through the school for placement can enroll in the Amherst Select Internship Program. In the program, prospective interns attend workshops, meet with advisers, and receive feedback from internship supervisors. Learners apply to the the program through the Loeb Center for Career Exploration and Planning. For first-generation and low-income students, the Loeb offers resources to assist them throughout their college career. The Summer Science Undergraduate Research Fellowship Program lets students live on campus while receiving $440 per week to participate in a science-based research project. Claremont McKenna College lets students register their internships for academic credit and non-credit. For academic credit, students must intern for six weeks at minimum and write a paper detailing their experience. Non-credit internships do not require a paper, but are added to the intern's transcript. To encourage internships, the school has the Sponsored Internships and Experiences Program. On average, program members receive a $3,400 stipend to cover expenses while interning. The school also runs an internship database which tracks all CMC student placements since 2013. Users can find employers that accept CMC interns and contact past interns to gain company insight. Students can also meet with an on-campus career coach that works with different interest clusters, such as law and public policy, to direct students to opportunities that fit their skillset. Additionally, CMC partners and 16 other liberal arts colleges have the National Internship Consortium, an online database with over 3,000 experiential learning listings. The Olin College of Engineering, also known as Franklin W. Olin College of Engineering, was established in 1997. The school understands the importance of hands-on learning and fosters engineers through fellowships and internships. The Arts and Action Fellowship pairs engineering majors with an arts or non-profit organization. Many of these organizations are backed by the Andrew W. Mellon foundation. Students work during the summertime to fulfill obligations. The Cultural Vistas fellowship sponsors an eight-week internship in Argentina, Germany, or Singapore for an underrepresented Olin student. Fellows meet in New York for a pre-departure orientation and a virtual learning seminar. Olin covers all expenses and living arrangements. Students applying to graduate school should look into the Department of Energy Computational Science Graduate Fellowship. Fellows receive a $36,000 yearly stipend while conducting research as a full-time graduate student. The University of Georgia (UGA) reaches out to companies in industries ranging from winemaking to politics to give students comprehensive learning experiences. The College of Agricultural and Environmental Sciences facilitates the Georgia Legislative internship, Winegrowers of Georgia internship, and the UGA extension internship. The Senate Agriculture and Consumer Affairs Committee orchestrates the 12-week internship for learners that want to know more about agricultural issues in Georgia. Students majoring in viticulture and enology get a firsthand look at the winemaking process by interning with local winemakers for summer or fall. The extension internship matches a UGA student with an agent for a semester-long cooperative learning experience. The Office of Sustainability Student Internship Program organizes its own placements that pair interns with staff members. Students spend at least 10 hours per week at these internships. The St. Lawrence career services office created a guidebook for students interested in internships. The publication features informative tools, such as sample cover letters and career planning tips. Career services organizes different programs to empower learners. Shadow-A-Saint lets students job shadow professionals from the alumni association. The program lasts one to five days and is organized by the career services team. Students interested in developing a closer professional relationship with an alumnus can join the LINC Mentor program. For one year, students meet regularly with an alumnus to discuss career plans and goals. Learners can also participate in the internship fellowship program. Through this initiative, university students receive funding to offset living expenses while they complete an unpaid or low-paid placement. The fund is open to students in a placement that lasts for eight weeks or longer and interns must work at least 30 hours per week. The State University of New York (SUNY)-Maritime College caters to the global marine transportation industry. The school offers 10 bachelor's programs, including engineering and finance, that have a connection to the marine industry. SUNY-Maritime College has a partnership with the U.S. Coast Guard that allows students to receive Coast Guard licenses while attending school. The Office of Career Services links students to employers in the maritime industry like the New York City Department of Environmental Protection and the U.S. Marine Corps Aviation Logistics center. The school holds professional training courses to prepare students to become mariners. Students in the science department can take environmental science internships courses to receive academic credit for internships. To receive credits, students must intern for at least 20 days and submit a written proposal to the science department. The engineering department also offers internship credits, namely industrial internship courses where students receive three academic credits for a 40-day placement. The California Institute of Technology, better known as Caltech, champions science and engineering with world-renowned research projects that have earned the school more than 30 Nobel prizes. The Institute cultivates an equally impressive student body using experiential learning. The Career Development Center (CDC) hosts career fairs and offers career counseling by appointment. The CDC holds workshops and information sessions geared towards internships. During these sessions, students meet professionals from Microsoft and Intel. The CDC promotes job hunting resources, including the Aeronautics Jobs Network and Biocareers, for science majors looking for jobs and internships. The school's Summer Undergraduate Internship Program merges information sessions with career coaching for students. Students can attend workshops that highlight different topics, like networking and social media, and have access to career coaches. Students can register and schedule appointments through the handshake website. Bentley University Career Services center takes its job seriously as a career planning resource. The CareerEdge section of the services site features hundreds of employers looking for talented students to intern or work. Students click on company profiles to learn more about the organization and apply for open positions. Users can watch YouTube videos featuring current employees. Filters allow users to search specific fields like internships or consulting jobs. The school launched the micro internship program to give students the chance to work for major employers. Students create a profile and apply for various short-term assignments. These assignments are paid projects commissioned by larger companies with manageable deadlines. By working on projects, students build relationships with employers that can lead to on-site placements. The HIRE Education initiative is a system students use throughout their time at Bentley to help land jobs and internships. The methodology used considered a school's academic programs, attendance rates, graduation rates, and career centers. Institutions with exceptional career centers offer many unique internship placements and one-on-one guidance for students. Learners at these schools have internships at reputable companies and have successful careers. All of the schools listed have been featured in a ranking for other factors. This system takes an in-depth look at the career advising and assistance schools offer students. Depending on resources, students can obtain high-level internships and receive job offers within months of graduation.